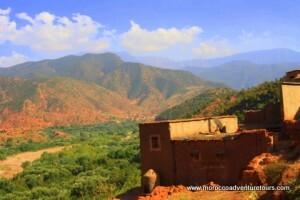 The Ourika Valley Tour with Splash Morocco is a full-day trip to the stunning Moroccan countryside, a short drive from Marrakech. Visit a traditional Berber house, enjoy breakfast and delicious mint tea, experience a camel ride and a drive to Setti Fatma in the foothills of the Atlas Mountains. From here you hike to a stunning waterfall and a visit to a local Argan oil co-operative. A very filling lunch of traditional Moroccan cuisine including couscous and tajines adds the final touches on a fantastic day journey into the heart of the Ourika Valley. This full-day tour costs just £65 / 800dh per person and includes all transport and food. We leave Marrakesh at around 9am and drive toward the Atlas Mountains, taking in the beautiful landscapes and authentic Berber (16th and 17th century) villages. First stop is a visit to a traditional Moroccan house, learning about the lives of indigenous Morrocan village people, including traditional Berber cuisine. Experience stunning views of the village and valley from the roof of the house. The Lady- the owner of the house – conducts a tea ceremony and demonstrates how to make mint tea, served with a traditional country breakfast (bread, butter, honey, olive oil and tea). 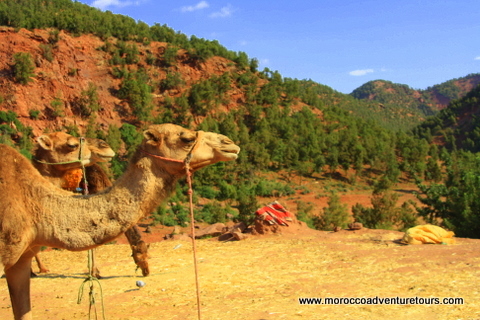 After leaving the the Berber village we explore further down the valley, stopping for a 20 minute camel ride, followed by a short hike to check out some spectacular waterfalls. Lunch follows this (a short drive from the hike) in a lovely restaurant with beautiful views of the valley serving a variety of traditional Moroccan cuisine. At about 5pm, we arrive back in Marrakesh. To book your Ourika Valley Tour contact Splash Morocco – email info@moroccoadventuretours.com or call UK +44 (0)1887 820303 or Morocco +212 (0)618 96 42 52.